"Thanks again! RideMax made our Disney experience very enjoyable even during the busiest time of the year!" "Because of the software..., in the two days we were [at Disneyland] we were able to ride absolutely everything we wanted to, without becoming completely overwhelmed by crowds and burnt out by lines." "Overall I would rate this... a '10' for 'terrific' and would definitely purchase it for my next trip to Disneyland.... Good luck with the program, I know it will be a big hit." Read more RideMax Customer Reviews and Testimonials! You may see the down-to-the-minute wait time estimates on this RideMax plan and wonder, "Why would RideMax even attempt to publish wait time estimates? Surely I'm not going to end up at Dumbo at exactly 8:16AM, am I?" No, probably not -- it might actually be 8:17AM (just kidding)! 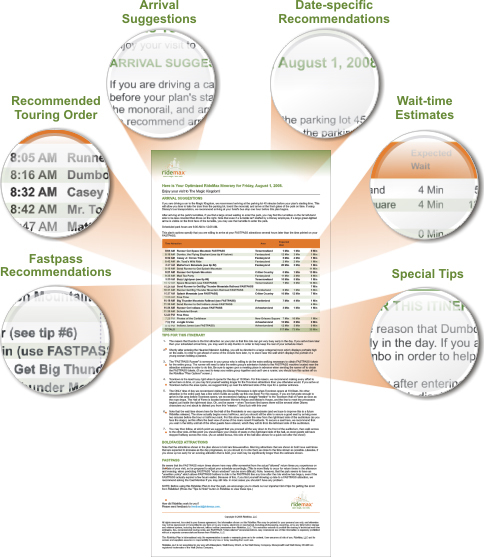 But these wait time estimate numbers do make clear what the RideMax software was assuming when it created your plan. This gives you the chance to adjust your schedule "on-the-fly" if you notice something unusual while visiting the park. For example, suppose that we at RideMax put together our wait time estimates for Pirates of the Caribbean on a busy day like this and expect a 13-minute wait at 10:35AM. This estimate is then reflected on your actual plan. Suppose further, however, that on the day of your actual visit to the park, three of the Disney Cast Members scheduled to work "Pirates" have called in sick. When you show up the actual posted wait time is 30 minutes! Because you have our 13-minute estimate in front of you, you would most likely show up and see the 30-minute wait, realize that either we totally "blew it" on the estimate (which we hope is NOT the case), or that there must be some sort of "operational difficulty" with the ride. In such a situation, we normally recommend that you simply skip ahead to the next attraction on your plan, or try back later in the evening, when there is a chance that the wait will have died down a bit. The other, more significant reason for the wait time estimates is that they give you a leg-up during the planning process itself. If you create one plan and see wait time estimates which are too long for your liking, you can adjust your planning parameters in the software and create a new plan instead. Possible adjustments may include setting an earlier arrival time or visiting a lower-rated (and less busy) attraction rather than attempting three rides on the ever-popular Peter Pan's Flight, for example. We hope you'll appreciate all of these little details that make RideMax such a powerful Disneyland planning tool. 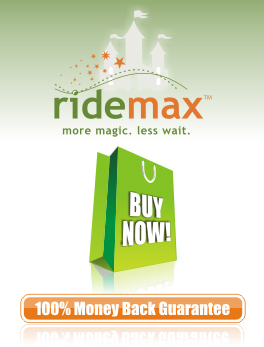 Why not download RideMax now and start planning your Disneyland vacation today!? Copyright © 2019 RideMax, LLC. RideMax is in no way affiliated with Disneyland, Walt Disney World, or the Walt Disney Company. Disneyland® and Walt Disney World® are registered trademarks of the Walt Disney Company.